All members are required to learn and adhere to the club’s safety rules. The club will provide full & frequent access to and reminders of our safety rules through written and Internet based electronic communications. We will happily assist in helping members gain access to advanced firearms safety & competency training from several different avenues. In order to ensure that all users of the rifle and pistol ranges are fully educated on and understand the rules for safe use of those ranges, anyone using the rifle and pistol ranges is REQUIRED to take the Rifle and Pistol Ranges Safety Course. Full access to the pistol and rifle ranges for all hours of normal operation supervised or unsupervised will be granted for any RB member that is a Certified Range Officer or Safety Instructor from any nationally recognized organization such as NRA, USPSA, IDPA, etc. or if they have completed other NRA safety classes. The member would need to present their credentials to the Safety Committee and their access card could then be updated to allow extended hours access. NOTE: This exemption applies only to nationally recognized organizations; neither gun safety learned from family and friends, nor years of experience handling guns safely, will qualify members for this exemption. All rounds fired must impact the back berms of the bay. No targets of any kind can be placed on the ground. You may never shoot at the ground for any reason. Never shoot at any inappropriate targets which would create a hazard for other persons, cause a ricochet, or damage the environment. Steel or metallic targets of any kind and their stands must be approved for use by the club manager or the RB safety committee prior to use at Rochester Brooks. ~ Approved metallic targets must be commercially produced by a reputable firm or business; no homemade metallic targets of any kind are allowed. No handling of firearms when someone is downrange. IE: If someone is in front of you, don’t handle your firearm. ALWAYS TREAT A FIREARM AS IF IT IS LOADED – ALWAYS!! Always point the muzzle in a safe direction; never point a firearm at anyone or anything you don’t want to shoot. ALWAYS treat every firearm as if it is loaded. NOTE: The 4 Rochester Brooks Golden Rules and NRA safe gun handling rules are posted in the clubhouse, on every pistol bay, at the rifle range and on the road on the way to the ranges. It is your responsibility for knowing, understanding and adhering to these rules at all times. As a Rochester Brooks member, you and you along are 100% responsible for your safe gun handling actions and the actions of your guests while on Rochester Brooks property. Only approved targets may be used in casual shooting. You may see authorized events at various times here at RB using different target types or placements. But that doesn’t mean it is acceptable for causal shooting. In all of these situations these have been approved by the safety committee and there is a range officer present to supervise the shooter. No glass, ceramic, concrete, appliances, electronic components or any object that may cause a ricochet or fragment or leaves debris may be used. Proper placement of the target is also a critical factor in range safety. When placing a target, always take the trajectory of the bullet into consideration. The target must be placed so that all rounds fired impact the back berms of the bay. Bullets should not hit the ground at any time, as this can cause dangerous ricochet and/or rounds leaving the range. 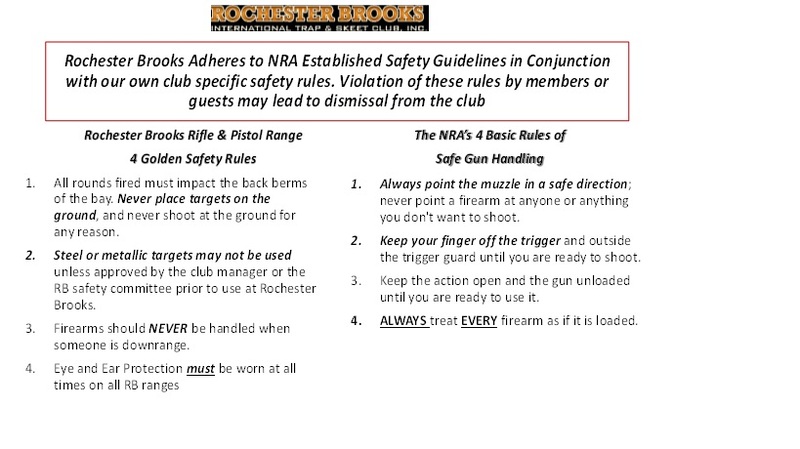 Rochester Brooks guest policy mandates that there should never be more than two guests shooting at one time, and they are to be under your direct supervision while shooting or handling firearms. It’s not practical to watch more than two shooters at a time. You are the range safety officer for your guests. They are not to be shooting while you are. You are not shooting while they are. As a Rochester Brooks member, you & you alone are 100% responsible for your safe gun handling actions and the actions of your guests while on Rochester Brooks property. Any violations of the safety rules should be reported to a member of the Safety Committee immediately. The Committee will review the violation and discuss the need for sanctions, up to and including permanent removal from the ranges. Violations will be reviewed on a case by case basis, based on the unique circumstances of each case. As needed, the Committee may ask that the violator appear before the Committee in conjunction with the Board of Directors to discuss the violation and its implications and proposed sanctions. The Board of Directors has the authority to determine and apply sanctions as needed in order to ensure the safety of the ranges and those using the ranges. Ignorance of the rules is NOT a valid excuse or defense. The purpose of the RB Safety Committee is to oversee safety policies, procedures and practices of the Rochester Brooks Gun Club. The Committee will meet on a quarterly basis, and twice a year the meeting will include a walking inspection of all ranges and courses at the Club.